Chinese prisoners of conscience are denied family visits at the New Year. 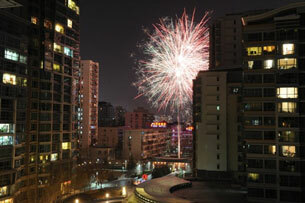 AFP/Fireworks light the night sky over Beijing on the eve of the Lunar New Year on Feb. 2, 2011. Millions of Chinese will sit down this evening to a lavish New Year celebratory dinner with family and other relatives to mark the transition from the Year of the Tiger to the Year of the Rabbit in the Chinese zodiac. But for China’s prisoners of conscience, the picture is far bleaker, with many denied the right to a family visit. Some of them had been released and were looking forward to spending the occasion with their families, only to be jailed again. Authorities in the central city of Wuhan detained veteran pro-democracy activist Qin Yongmin on the eve of China’s lunar New Year festivities, his relatives said on Wednesday. “She had planned to go and visit him this year, but then it turned out he was detained the day before yesterday,” she said. Qin, who was released from prison on Nov. 29 after serving a 12-year prison term for “endangering state security,” has been under 24-hour surveillance ever since. Fellow activist Tian Li said several friends had gone to his home to visit him in recent days. Qin, 57, ignored warnings following his release that he should keep a low profile, publishing an open letter to President Hu Jintao in which he called for the release of jailed Nobel peace prize laureate Liu Xiaobo. He also released a statement saying that the now-banned China Democracy Party (CDP) he helped found was “the future,” in spite of being warned by police not to write any more articles. Liu Xiaoxuan, brother of Liu Xiaobo, said Chinese New Year is a time when families want to be together, though he has been denied permission to visit his brother in jail. Meanwhile, Hua Chunhui, whose fiance Wang Yi was sent to labor camp for one year for a single Twitter comment, said he had tried to get news of Wang ahead of the festival. “I asked her lawyer Lan Zhixue to go to the labor camp and find out how Wang Yi is, but they wouldn’t tell him,” Hua said. Zeng Li, wife of jailed Sichuan-based dissident Huang Qi, said this is a hard time of year for the family. “This is a time when the whole family should be together,” said Zeng, who hasn’t been allowed to visit her husband since June 2010. Newly released dissident Hua Ze said she wishes a happy New Year to all of China’s prisoners of conscience. “To all the grass-mud horses, dissidents, and those who have joined the movement for peaceful noncooperation, all political prisoners and all of our comrades, whether I know you or not, I wish you all the best,” she said, referring to online campaigners to end censorship. “I hope that this situation will end soon, so that we can all express our thoughts freely,” she said. Reported by Xin Yu for RFA’s Mandarin service, and by Ho Shan and Fung Yat-yiu for the Cantonese service. Translated and written in English by Luisetta Mudie.